When Jesus met the first of His disciples, He asked, “What are you looking for?” (Jn 1:38). Today, Simon tells Him, “Everyone is looking for You.” What happened in between? As we continue in St. Mark’s Gospel, we see that after Jesus left the synagogue in Capernaum, where He had taught and exorcised demons with great authority and power, He “entered the house of Simon and Andrew with James and John.” Simon’s mother-in-law was quite sick. When He was told about it, Jesus “approached, grasped her by the hand, and helped her up.” She was healed. By the end of the Sabbath rest, when Jews were able to move around carrying sick and troubled people, they “brought to Him all who were ill or possessed by demons.” The buzz about Jesus developed and spread quickly. St. Mark describes this most eloquently: “The whole town was gathered at the door.” Are we able to “see” this picture? What a dramatic demonstration of how eagerly people wanted to be near Jesus, to have His help for all the enormous problems of their loved ones or friends. Aren’t we all, today, still taking people to Jesus this way, in our prayers and care for them? So many (actually, most) of Jesus’ miracles of healing and exorcism in the Gospels were done as the result of an intercessory request. It must have been a long and exhausting day for Jesus. However, “rising very early before dawn, He left and went off to a deserted place, where He prayed.” Do we wonder what He prayed about? 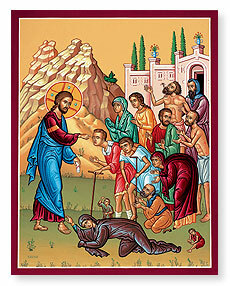 What had it been like for Jesus to see so many sick and burdened people? How did His human heart react to such a scene of suffering? He turned to His Father. They communed alone. The solitude came to an end when “Simon and those with him” found Jesus. “Everyone is looking for You.” In such a simple statement, with only five words, Simon summed up the entire human condition, from the Garden of Eden until now. When the townspeople of Capernaum heard Jesus’ authoritative teaching, when they saw Him heal the sick and cast out demons, they knew that somehow He answered life’s deepest needs. Whether men are conscious of seeking God or not, they know they long for someone to put all the messes of life, both public and private, right. We all wish someone would show up and break the curse of evil, suffering, and death. Someone did. Jesus was willing to leave what must have been a time of solace for Him to take up again the work He was given by the Father to do: “Let us go to the nearby villages that I may preach there also. For this purpose I have come.” Isn’t it interesting that God chose this particular method, preaching, as His way to alert the world that it was about to be turned upside down? Being God, He could have done it in a million different ways—Jesus could have dictated a book, printed newspapers, even written on the sky. Instead, He preached. It would be a man’s voice that would proclaim God’s truth and redemption. Jesus gave Himself fully to this work. He knew everyone was looking for Him. Possible response: Lord Jesus, help me remember that somehow You are the answer to all that troubles me. Never has the human condition, which experiences such great helplessness over the forces that appear and disappear, been more aptly described. Now can we understand why “everyone” was looking for Jesus? Possible response: Heavenly Father, I have tasted the misery of Job. Thank You for sending Your Son to rescue all of us from it. Here we find St. Paul describing the fire in his bones that led him all over the Greco-Roman world, several times, to preach the Gospel: “Woe to me if I do not preach it!” St. Paul understood that God has chosen the preaching of a human voice to spread the Good News of His love and provision for man. He explains here that, in order to make his preaching available to people without the burden to them of supporting his material needs, he offered “the Gospel free of charge.” Jesus Himself said that laborers in His harvest were worthy of their hire (see Lk 10:7), but St. Paul willingly forfeited that right (he earned his living making tents). He was a man convinced that preaching God’s message was the source of renewal for the whole of Creation. He urged other evangelists to do the same. To Timothy, bishop in Ephesus, he wrote: “Preach the word, be urgent in season and out of season, convince, rebuke, and exhort, be unfailing in patience and teachings” (2 Tim 4:1-2). Possible response: St. Paul, please pray that God would raise up evangelists, especially among the clergy, to preach the saving message you preached so effectively. Our world needs conversion.